My mom asked me the other day about going to a Tigers game while we are back for the weekend in Michigan. I checked with Ryan and he was down, so she signed us up :) I hear my dad got AWESOME seats with one of his connections, so we are super excited (and Ry has never been to a Tigers game in Detroit [we've been in San Diego and LA together], which should be fun for him). Anyway, last night while we were at dinner we were chatting about the possible promotions at the game. I told him that most Friday night games the promos are the fireworks. He didn't believe me, and we left it at that. This morning, while he is still sleeping, I figured I would look it up. 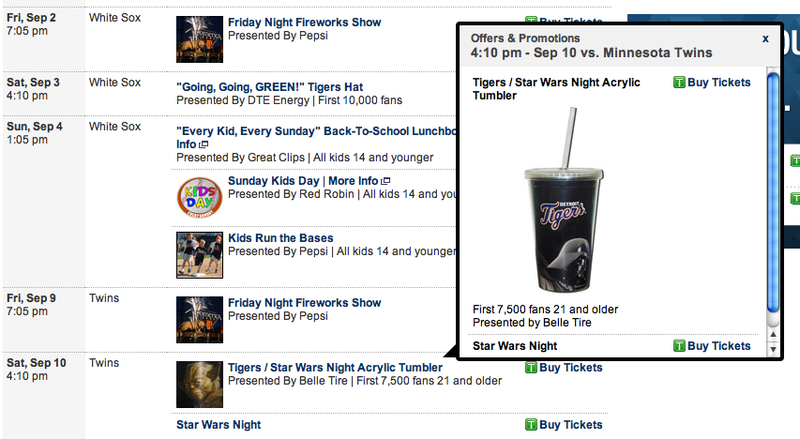 I WAS RIGHT (OF COURSE) and the promo for the 9th is fireworks, but then I looked to see what the next day was and SMILED :) September 10th is STAR WARS NIGHT at the Tigers game. Now I don't like Star Wars, but Ry loves it! Maybe I'll be able to go to the Help Desk and ask them if I could buy one of the cups for Ry, especially since the 10th is my birthday and we came all the way from California (maybe they will have pity on me, hehe).